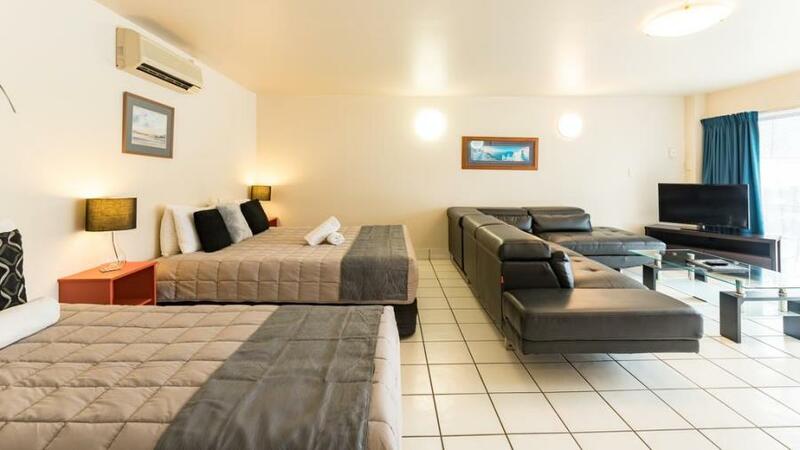 Studio Queen Apartment, queen-size bed, tea and coffee facilities, no kitchen. En-suite bathroom with shower and separate w/c. LCD 32" TV, 15 Channels & Sky TV. Ceiling fan. Recommended for short stays as very small. This king studio features a king size bed. The kitchen has a 2-burner stove, microwave, cooking utensils and refrigerator. Includes a 32-inch LCD satellite TV. Fully self contained executive apartment with Super King Bed, and 1 Single bed. Bathroom with Spa Bath, Italian Design Kitchen, Sky TV, and is Air Conditioned. Fully self contained One bedroom apartment with Queen-size Bed plus single bed in bedroom. Full lounge with Single bed, Kitchen, Microwave and two stove elements plus Fridge, bathroom. Spacious design apartment with 1 bedroom with king-size bed, bathroom with bath tub, large walk in shower, spacious lounge area. Kitchenette, Sky TV with 50+ channels. Queen-size Bed in one room and two singles in the second.Full lounge with Kitchen, Microwave and two stove elements plus fridge. Large family apartment, queen-size bed & single bed in 1st bedroom, and queen size bed in 2nd bedroom, plus two single beds in lounge area. Full lounge with kitchen, microwave and oven and Samsung dishwasher. Open plan living with lounge, LCD 32" TV with 15 channels & Sky TV. Toilet to bathroom, which has a 2 person spa bath plus the apartment has air conditioning. Deck with BBQ.